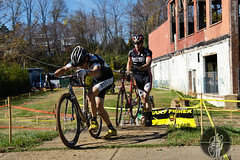 Urban Cross at Ix 2009 took place on November 15 in Charlottesville, Virginia. The course takes place on the grounds of an abandoned factory and features a ton of elevation change, good power sections and on this day, unseasonably warm temperatures. The video is from the first ten minutes of the Masters 3/4 race. Pay special attention to the rear-facing camera at about the 45 second mark. The race comes to a standstill as riders start piling up on the muddy off-camber turn. Good lesson in why a decent start is important. You don’t need to win the hole shot, but being near the front is the best way to avoid the bottlenecks. There was a lot of running on this course. The heavy rains leading up to race day made the normally ridable hills unridable. There was also a staircase and one set of barriers. As you will see, these barriers jumped up and got me on the first lap. Music this week is by The Burdens. Check them out at www.theburdens.com. Another great film and another great soundtrack, reminded me of Dinosaur Jr. (Jay like vocals with a heavy bass).